When the invading Magyars conquered land in Eastern Europe from the Slavs about 900 AD, and started the country of Hungary, they didn’t stop there. Wait, who were the Slavs? The Magyars immediately started raiding and plundering their neighbors further west: the Holy Roman Empire in what is now Germany and northern Italy. The Holy Roman Empire was very weak in the 900s AD, so the Hungarians won a lot of battles. They raided all the way across the Holy Roman Empire into southern France and northern Spain, and even north to Denmark. What was the Holy Roman Empire? 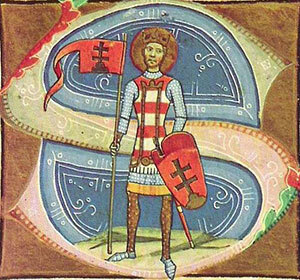 But in 955 AD, Otto I of the Holy Roman Empire managed to defeat the Hungarians. Under Otto, the Holy Roman Empire was stronger, and the Hungarians couldn’t raid to their west anymore. Poland, to their north, also became a united, strong country in the late 900s AD, so the Hungarians couldn’t attack them either. They attacked the Holy Roman Empire, but by 976 under Basil II, the Romans were too strong for them too. By 1000 AD, King Vajk of Hungary (like the Poles and the Russians a little earlier) converted to Christianity as King Stephen, so the Pope was on Hungary’s side and other Europeans began to accept Hungary as a normal country instead of just being scared of the Magyars. What was going on in Russia? Stephen’s descendants ruled Hungary all through the High Middle Ages. As the Holy Roman Empire got weaker in the late 1100s, Hungary conquered some of it. In 1222 AD, though, the rich families of Hungary – probably inspired by the Magna Carta in England – forced King Andrew II to sign the Golden Bull. The Golden Bull was a contract between the rich families and the king. 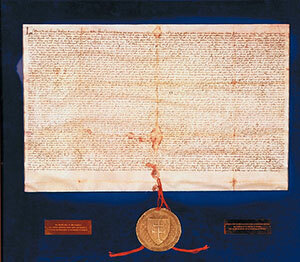 Like the Magna Carta, it said that even the king had to obey the law. Also, the king couldn’t send soldiers to live in the rich people’s houses, or arrest rich people without a good reason. But where the Magna Carta said that the king couldn’t charge new taxes without the permission of the rich families, the Golden Bull said that the king couldn’t charge rich families any taxes at all! The Golden Bull also said that no Jewish person could hold any government job. In the early 1200s AD, Hungary was a big, successful, strong country in Central Europe. But this was about to end. Cite this page: Carr, K.E. Medieval Hungary – Magyars. Quatr.us Study Guides, August 2, 2017. Web. April 26, 2019.